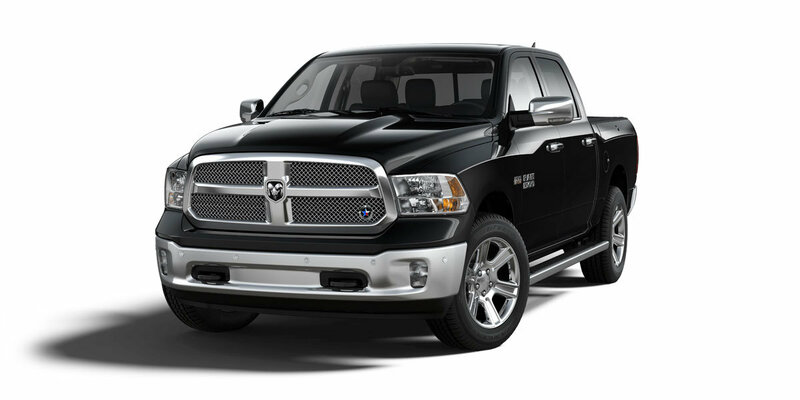 Whether you need a new truck for work, heavy hauling, or just everyday drives, there is a Ram Pickup 1500 that will fit your needs and budget. This truck is extremely customizable—it comes in multiple trims, and each is available in a few cab sizes. A 7-inch color display, standard on certain trim levels, rounds out this truck. You can customize information to your liking, and quickly view your vehicle’s performance levels without losing focus on the road ahead. We know you’ll love the fact that the Ram 1500 has a 5-year/100,000-Mile Diesel Powertrain Limited Warranty, and a 5-Year/60,000-Mile Gas Powertrain Limited Warranty. Whether you choose a gas or diesel truck, you’ll also get five years or 100,000 miles of roadside assistance. Whichever vehicle you choose, you’ll feel a sense of safety knowing that every Ram 1500 is equipped with dynamic crumple zones, advanced airbag systems, and many other advanced safety and security features. Come check out the 2018 Ram Pickup 1500 in person at Ashland Ford Chrysler! 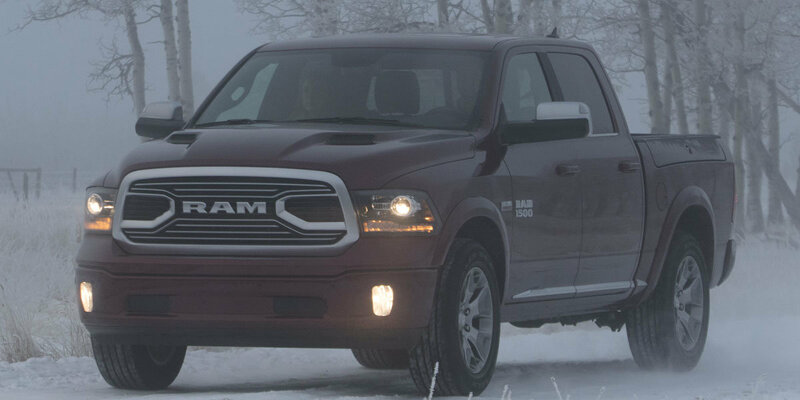 Test drive the Ram 1500 today by calling 715-682-8400. Instrument cluster screen size: 3.5 in. Instrument cluster screen size: 3.5 in. Instrument cluster screen size: 7 in. Instrument cluster screen size: 7 in. Instrument cluster screen size: 7 in. Instrument cluster screen size: 7 in. Instrument cluster screen size: 7 in. Instrument cluster screen size: 7 in. Instrument cluster screen size: 3.5 in. Instrument cluster screen size: 7 in. Instrument cluster screen size: 3.5 in. Instrument cluster screen size: 7 in. Instrument cluster screen size: 7 in. Instrument cluster screen size: 7 in. Instrument cluster screen size: 7 in. Infotainment screen size: 5 in. Infotainment screen size: 5 in. Infotainment screen size: 8.4 in. Infotainment screen size: 8.4 in. Infotainment screen size: 8.4 in. Infotainment screen size: 8.4 in. Infotainment screen size: 8.4 in. Infotainment screen size: 8.4 in. Infotainment screen size: 3 in. Infotainment screen size: 8.4 in. Infotainment screen size: 5 in. Infotainment screen size: 8.4 in. Infotainment screen size: 8.4 in. Infotainment screen size: 8.4 in. Infotainment screen size: 8.4 in. Includes bright chrome front and rear bumpers. Includes engine block heater and winter front grille cover. Includes front suspension skid plate, transfer case skid plate shield, and tow hooks. Includes 20 x 8 semi-gloss black aluminum wheels with p275/60r20 bsw all-season tires, flat black badges, black headlamp bezels, body color door handles, black painted honeycomb grille, black ram head tailgate badge, and painted front and rear bumpers. Includes 20 x 8 semi-gloss black aluminum wheels with p275/60r20 bsw all-season tires, black headlamp bezels, body color grille with black ram head, black ram head tailgate badge, and flat black badges. Includes heated front seats, and heated leather steering wheel. Includes 17 x 7 inch matte black aluminum wheels and black powder coated front bumper. Includes 17 x 7 inch aluminum wheels, bright front and rear bumpers, and bright grille. Includes automatic high beam headlamp control, rain-sensitive windshield wipers, keyless go, and remote proximity keyless entry. Includes carpet floor covering, front floor mats, cloth 40/20/40 bench seat, and one year of siriusxm satellite radio service. Includes glove box lamp, auto-dimming heated, power folding, and power adjustable exterior mirrors with supplemental signals and courtesy lamps, rearview auto-dimming mirror with microphone, leather wrapped steering wheel with audio controls, electroluminescent instrument cluster, overhead console with universal garage door opener, rear dome light with off and on switch lamp, dual sun visors with illuminating vanity mirrors, underhood lamp, and led bed lighting. Includes black heated fold-away power exterior mirrors, power door locks, power windows with driver and passenger one-touch down, premium vinyl door trim with map pocket, and remote keyless entry with all-secure. Includes 8.4 inch touch screen display, apple carplay, android auto, am/fm radio, hd radio, integrated voice command with Bluetooth®, media hub with usb and auxiliary audio inputs, gps navigation, siriusxm satellite radio with traffic plus, travel link and guardian, and rearview auto-dimming mirror with microphone. Includes "longhorn" tailgate letters, chrome ram grille, center stack walnut veneer, leather wrapped grab handles, and luxury front and rear floor mats. Includes 3.55 rear axle ratio with 3.6l v6 engine, or 3.92 rear axle ratio with 3.0l v6 turbodiesel or 5.7l v8 engine, anti-spin differential rear axle, and trailer tow mirrors and brake group including power black heated trailer tow mirrors with supplemental signals and courtesy lamps, and trailer brake control. Includes 20 x 9.0 inch satin carbon finish/mineral gray aluminum wheels, tungsten chrome badges, black bi-function projector headlamps, sport tail lamps, sport performance hood, body color door handles, chrome ram grille, body color ram tailgate nameplate, painted front and rear bumpers, chrome exterior mirrors, body color running boards, and chrome bodyside molding. Includes black ram head tailgate badge, flat black badges, sport performance hood with mopar sport performance hood decal, deluxe cloth high-back bucket seats, power lumbar adjustment, folding flat load floor storage, full length upgraded floor console, and rear 60/40 split folding seat. Includes 20 x 9 inch chrome clad aluminum wheels with p275/60r20 owl all-season tires, full size spare tire, remote keyless entry with all-secure, cloth 40/20/40 split bench seat, front armrest with three cupholders, rear folding seat, carpet floor covering, front and rear floor mats, uconnect with 5 inch touch screen display, am/fm radio, gps antenna input, integrated voice command with Bluetooth®, media hub with usb and auxiliary audio input, remote usb port for charging only, one year of siriusxm satellite radio service, overhead console, and rear view mirror with microphone. Includes built-into-the-bed cargo rail system with four sliding adjustable cleats for tie-down versatility, a removable and adjustable divider that converts to a two foot bed extension to secure loads up to 7 feet long, spray-in bedliner, power sunroof, premium cloth bucket seats, 10-way power adjustable driver seat with power lumbar adjustment, rear 60/40 split folding seat, full length floor console, folding flat load storage, remote usb port for charging only, 115v auxiliary power outlet, 8.4 inch touch screen display, apple carplay, android auto, am/fm radio, hd radio, integrated voice command with Bluetooth®, media hub with usb and auxiliary audio inputs, gps navigation, siriusxm satellite radio with traffic plus, travel link and guardian, and rearview auto-dimming mirror with microphone. Includes 20 x 8 semi-gloss black aluminum wheels with p275/60r20 bsw all-season tires, full size spare tire, bi-function halogen projector headlamps with black bezels, sport tail lamps, black painted honeycomb grille, black ram head tailgate badge, black power heated fold-away exterior mirrors, power locks, power windows with one touch down, remote keyless entry with all-secure, cloth 40/20/40 split bench seat, front armrest with three cupholders, overhead console, carpet floor covering, front floor mats, premium vinyl door trim with map pocket, semi-gloss black hub, and uconnect with 5 inch touch screen display, am/fm radio, integrated voice command with Bluetooth®, gps antenna input, media hub with usb and auxiliary audio inputs, remote usb port for charging only, temperature and compass gauge, overhead console, rear view mirror with microphone, and one year of siriusxm satellite radio service. No satellite coverage in hawaii or alaska. Deletes hemi badge.